The Joined Forces carried out a sweep of the settlement in the Volnovakha district of the Donetsk region and advanced 1.2 kilometers. The corresponding information was provided by the volunteer fund Come Back Alive (Povernys Zhyvym). About 80 people lived in this village before the war. Residents left it a few years ago, terrorists looted the houses. Now the settlement is in the so-called gray zone. Despite the Minsk agreements, the militants used the territory of the village to fire at the positions of the Armed Forces of Ukraine (APU). “The defenders of Ukraine found in the gray zone Russian dry rations, where the cities of manufacture were indicated - for example, Perm and Moscow, as well as ordnance residues of the Armed Forces of the Russian Federation with erased markings,” the fund reported. Virtually the entire territory of the village is mined with Russian-made mines. In particular, the Ukrainian military discovered PMN-2 (anti-personnel mines), prohibited by the Geneva Convention. 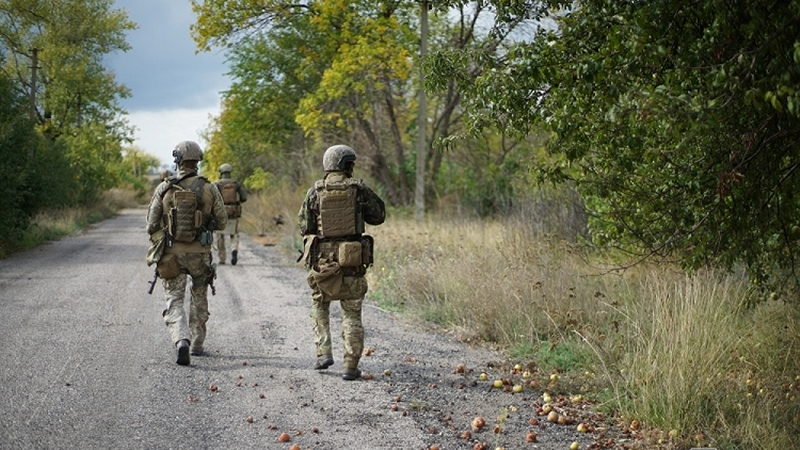 On May 22, 2014, a battle took place between the Armed Forces of Ukraine and the Russian-terrorist troops near Volnovakha, on the highway between Vladymyrivka and Olginka. During the clash 16 Ukrainian military were killed, and 40 were injured. Earlier, in the zone of Joined Forces Operation, due to the use of laser weapons by militants, an employee of the State Border Service of Ukraine suffered a retinal burn while surveillance with an optical device in the Marinka district. According to the Assistant to the Head of the State Border Guard Service of Ukraine, Colonel Oleh Slobodyan, this is the fifth case when border guards receive damage to the organs of vision due to the use of laser weapons in ORDLO.